Surely you’ve all seen the commercial…the guy is tailgating, he throws a quinoa (kwee-no to him, keen-wah to us) burger on the grill. He gets a little ridicule from his friends, but since it worked last time and his team won, he wants to try again. 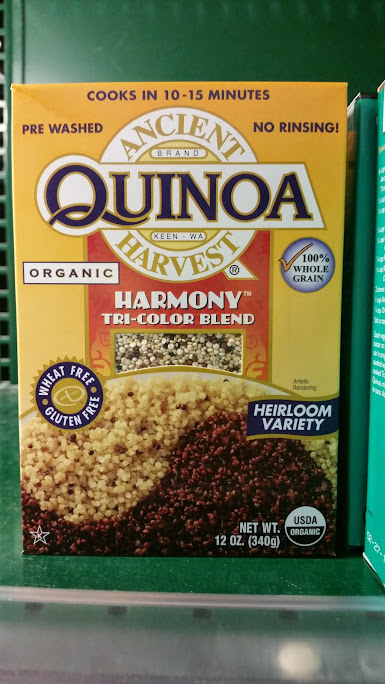 Fortunately for us, Quinoa comes gluten free. You can find this versatile ancient grain pretty much everywhere. From breakfast ‘oatmeal’ type meals to burgers, to sides, quinoa also can be a pretty versatile dish. We found Ancient Harvest brand recently at Harris Teeter. A simple Google search will help you find a variety of recipes. We liked all the kid-friendly ones at http://www.lilsugar.com/Quinoa-Recipes-Kids-30648160. Turkey zucchini quinoa meatballs? Quinoa and M&M cookies? Quinoa cakes? Lots of good ways to sample this grain.